West Bengal Post Office GDS Apply Online: Hi Friends West Bengal Postal Circle as invited the online application for the Gramin Dak Sevaks posts in WB State wide. Total 5778 number of vacancies is filling through Advt.NO. RECTT./R-100/ONLINE/GDS/VOL-V. Online application stat from the 05-04-2018 last date for submission online application is 04-05-2018. 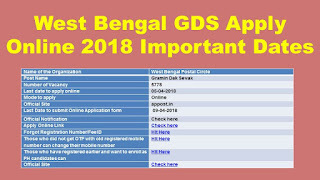 Those who are passed in the Xth Class are qualified for GDS apply online 2018. Selection Process is based on 10th Class Marks Merit based only. Any other qualification is not consider as a merit. 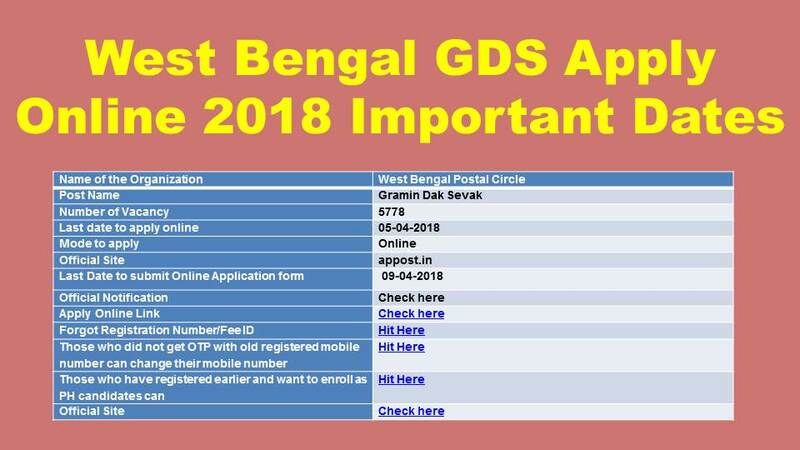 This article we are providing the complete information about west Bengal postal circle GDS 2018 apply online, Eligibility Criteria, Age Limit, Community wise Vacancies List and How to apply online. Indian Post-Offices WB Post office has invited the online application for the GDS Vacancies in West Bengal State wide. Total 5778 post are filling through west Bengal postal notification. Below tabular format is indicates community wise vacancies details. Aspirant must pass in the 10th Standard from the State Government or Central Government (CBSE) Educational Boards. Selection Process for West Bengal Gramin Dak Sevak is based on the 10th Class (X) merit based. There is no merit for any other higher graduation qualification. Application Fee: RS. 100/- Application fee should pay only OC/OBC Male Candidates.